Minnesota: Midwest or North? Karen Babine on why how we talk about place matters. 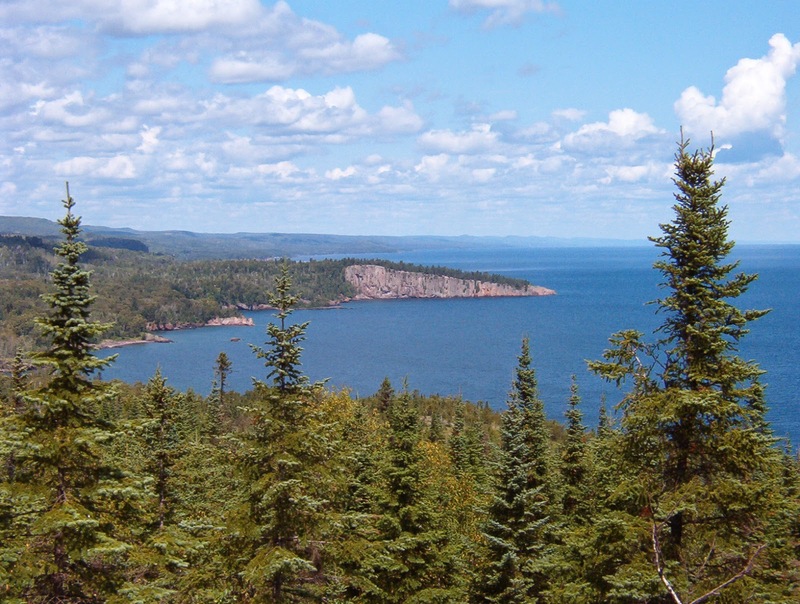 Tettegouche State Park in Minnesota on the North Shore of Lake Superior; photo taken from Palisade Head (foreground) looking NE to Shovel Point (midground) and Sawtooth Mountains (distant background). When I lived in eastern Washington, I learned the place was called the Inland Northwest and it had a separate identity from the western side of the Cascades. In Nebraska, I learned what the Great Plains meant, that they were not exactly the Midwest. Minnesota: Midwest? North? How we come to talk about the places under our feet seems to be an integral part of how we understand who we are, by knowing where we are in a way that is nameable and identifiable. I was living in Nebraska when it adopted the slogan Nebraska Nice, a move that elicited much eye-rolling from Minnesota. On one hand, I didn’t care too much, even as I wondered about Minnesota Nice™ as an ideal and identity. If we couldn’t lay claim to that phrase—what did we have left that was uniquely ours? Who were we, as a collective? Most Minnesotans have a list of trivia at hand when anyone challenges the legitimacy—and awesomeness—of the state. The first American to win the Nobel Prize for Literature? Minnesotan. I know that many of the important apples of the last several decades (Honeycrisp, SweeTango) have come out of the University of Minnesota Ag School. We have the Mayo Clinic, 3-M, Andersen Windows, Target, Best Buy. Books, music, movies, food, history—most of us have an arsenal of examples to argue that Minnesota is valuable, because it is also a state that’s easy to make fun of. Perhaps this is where the current debate about branding ourselves the North, a separate place from the Midwest, came from. Our state’s motto is Star of the North, after all. I still miss the hockey team being the North Stars, even though I don’t watch hockey. For myself, I don’t think too much about breaking away from the Midwest and claiming ourselves as the North. I think the idea is much more complicated than simple marketing. The idea of the North, from explorers like Roald Amundsen, writers like Sigurd F. Olson and Paul Gruchow, and more, is more of an ideal than it is a place, and it can’t be invented by boosters. Rhetoric is important—we know this. We talk about the rhetoric we used to turn the Great American Desert into the Breadbasket of the World, while still referring to it as Flyover Country, we acknowledge that we who live in the mid-section of the country are relying on outside voices to give us the geographical identity we feel we deserve. Naturally, we know that this place is important, even if Nobody Important thinks so. But this provokes a necessary question: who are we depending on to validate our geographical and state identity? Kent C. Ryden, in "Writing the Midwest: History, Literature, and Regional Identity," considers that regional identity, as practiced by writers (though the idea is more widely applicable), is based in “[distilling] felt and known local experience into words in order to replace insignificance with significance, vagueness with precision and meaning” (512). Geographical identity, by its very nature, is arbitrary, without clear definitions. Except for, perhaps, the exception of the Mason-Dixon line, where one region bleeds into another is always unclear. I like it this way—it makes us think, asks us to actively consider why identity and place matter. If Minnesota doesn’t feel like the Midwest, what does that mean? I tend to think that the idea of North almost by definition obscures, rather than clarifies—and I like that idea. In the introduction to the Japanese poet Matsuo Basho’s classic Narrow Road to the Deep North, his translator, Nobuyuki Yuasa, writes that “In the imagination of the people at least, the North was largely an unexplored territory, and it represented for Basho all the mystery there was in the universe.” Is the idea of the North a search for a place where mystery and wildness still exist? The idea is problematic under scrutiny, but I wonder if this is the root. My grandparents’ cabin in Hubbard County is still too far out for cable—in 2015—and I can still drive up the North Shore of Lake Superior and marvel that not only do I lose cell coverage for a significant portion of the drive, but also that there are still places in this country to be considered so remote, so untamed, so much unknown. But I live on the Red River Valley and my sunsets light the prairies in a show of space so immense as to be equally unknowable. Last weekend, I was in Park Rapids and among the essential updates on my home and friends, I got the information on the benefit pancake breakfast and silent auction for a high school friend who just had surgery, she who was my first friend when we moved to Nevis nearly thirty years ago. While we might like the unknowable mysteries from our landscapes, we seek the knowable from our communities. When we do not know the next step, when tomorrow is fogged to our view, we take care of what we can: we throw pancake breakfasts, we raise money for expenses, we organize meals and rides. Whatever the North or the Midwest is—whatever Minnesota is—it is grounded in the realities of life and love that retains what it means to be wild. 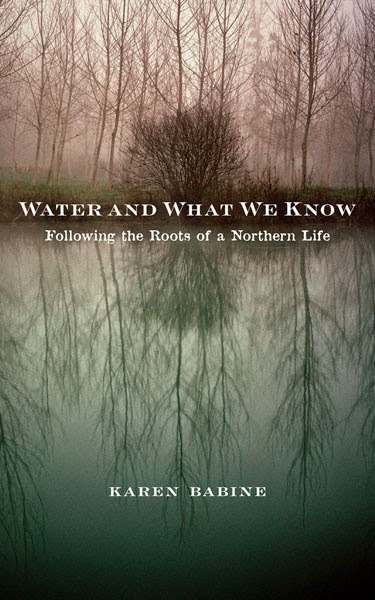 Karen Babine is assistant professor of English at Concordia College in Moorhead, Minnesota and the author of Water and What We Know: Following the Roots of a Northern Life. Her essays have appeared in River Teeth, Sycamore Review, North Dakota Quarterly, Ascent, and elsewhere. She is the editor of Assay: A Journal of Nonfiction Studies.